Keston Cobblers’ Club are the latest in a series of folk-pop bands who are going above and beyond the typical recording and touring process in an attempt to create an interactive musical experience for their audiences. They follow in the footsteps of successful folk-oriented bands like Cocos Lovers, who began hosting the annual Smugglers Festival in 2011 as part of the Smugglers Records label, and Stornoway, who have recently concluded the first ever Nature Reserves Tour in conjunction with the Royal Society for the Preservation of Birds. In the spirit of playing folk music in a naturalistic context, Keston Cobblers Club have organized an extended outdoor launch party for their new album ‘Wildfire’, in the form of an eponymously titled weekend festival called Camp Wildfire. Billed as a “bustling adventure camp” by day and a “wild forest music festival” by night, Camp Wildfire promises an eclectic mix of activities to match its namesake album’s eclectic mix of sound elements. The band’s updated sonic palette involves soaring string and brass arrangements and electro synth overlays, which provide a rich ornamentation for the more organic classical and folk elements. Traditional dance rhythms and complex vocal harmonies dominate the album, and the Cobblers use their expanded instrumentation to traverse a wide range of dynamic and textural values, often within the context of a single song. Lyrically, the songs all have an air of romantic tragedy about them, and the full, vibrant instrumentation lends itself well to expressing their almost operatic melodrama. Matthew Lowe’s powerfully emotional vocal delivery is exquisitely executed throughout the album, most notably in its swelling choruses. The song styles on ‘Wildfire’ are also quite eclectic, with more purely folk sounding tracks like ‘Won’t Look Back’ sitting comfortably alongside the soulful jazz tincture of ‘Contrails’, the tribally rhythmic title track ‘Wildfire’, and the tropical, almost reggae suggestion of ‘St Tropez’. The album is appropriately bookended by the delicate piano melody of darkly evocative opening track ‘Laws’ and the acoustic guitar echo of the intensely visceral closing track ‘The Mad’. What binds these songs together into a cohesive unit is their foundational focus on melodicism, vocal harmony, and boldly distinctive rhythms. With ‘Wildfire’, Keston Cobblers’ Club have created an album that stays true to the band’s established folk roots without ever being too tightly restricted by them. The album is both carefully crafted and enthusiastically energetic, which is always a winning combination in my book. 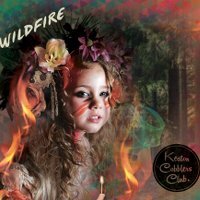 Keston Cobblers Club’s sophomore LP ‘Wildfire’ is due for release next Monday, the 15th of June, on Tricolour Records/Absolute via Universal. Previous TGTF coverage of Keston Cobblers’ Club, including details of their October and November 2015 tour dates, can be found here.